And hasn’t missed a chance to continue throwing against them…. 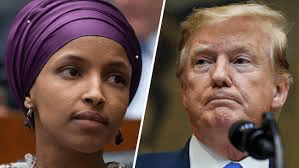 Mr. Trump and his team are trying to make Ms. Omar, one of a group of progressive women Democratic House members who is relatively unknown in national politics, a household name, to be seen as the most prominent voice of the Democratic Party, regardless of her actual position. And they are gambling that there will be limited downside in doing so….